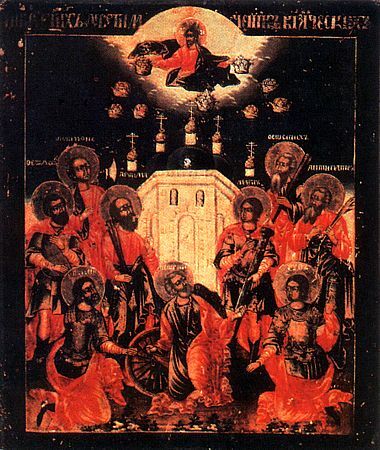 These nine holy Martyrs were from various places, but when they refused to offer sacrifice to idols or to deny Christ, all were beheaded together in Cyzicus, a city in Asia Minor on the coast of the Sea of Marmara. Their names were theognis, Rufus, Antipater, Theostoichus, Artemas, Magnus, Theodotus, Thaumasilas and Philemon. During the reign of the Emperor Constantine a church was built in Cyzicus in their honor, and their incorrupt relics were deposited there. They are commemorated April 29 on the Slavic calendar.